See 1350 nm, 400µW LED @ 8-ft.
See 1550 nm, 400µW LED @ 8-ft. The Objective Lens Accepts C-mount lenses without the need of an adapter. This new 25 mm, f/1.6 objective lens focuses from 200 mm (7.8”) to infinity. The included LP830-27 Filter is a screw on lens accessory. This longpass filter blocks the visible spectrum for a better signal-to-noise ratio when viewing the near-IR. (Threshold minimum @ 780 nm.) The built in aperture of the lens eliminates the need for an external iris accessory. .
Stackable Accessories. The optional Close-Up Lenses and mounted filters are threaded screw-on lens accessories. They have compatible threads so they can be stacked. 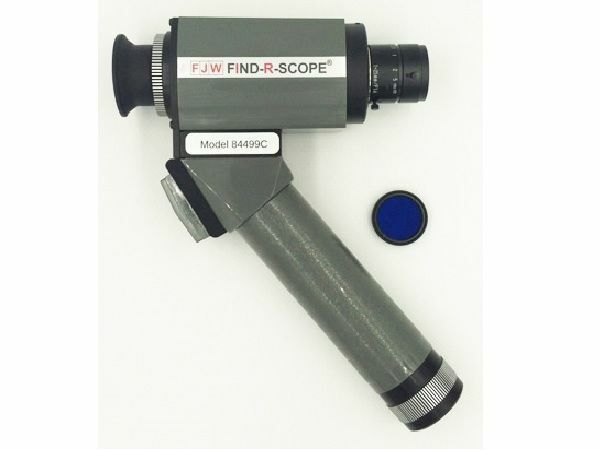 The FIND-R-SCOPE® has a wide variety of applications in many different industries. These applications are further expanded by taking advantage of the available accessories. (See right border for most popular accessories for this unit.) The optional close-up lens allows for viewing closer to align and verify fiber optic sources. The included visible blocking filter increases the signal-to-noise ratio by blocking visible light on applications such as inspecting infrared emitting diodes, aligning laser systems and examining art and other historic or legal documents. A variety of longpass, shortpass, bandpass, and neutral density filters can enhance other applications including low light surveillance, biological research, electrical maintenance, hot-spot detection, clinical medicine, and viewing in photographic darkrooms.